From reggae royalty Max Romeo to a host of folk fledglings, this easy-going Lake Garda get-together offers a crowd pleasing account of musical diversity, says Andrew Day. “This is one schizophrenic festival,” joked a Dutch Rastafarian as the rain hammered down on Saturday afternoon. Friday's acts had basked in glorious Italian sunshine but despite the downpour (and ensuing mud), nothing could dampen the spirits of a young crowd, many celebrating the end of university in one of Europe’s most dramatic landscapes. By Sunday, the Mandrea Music Festival – set on a cliff ledge overlooking Lake Garda – had become a quagmire, but when the rain finally faded, festival-goers took down their umbrellas and began hugging each other like survivors of a natural disaster. It took approximately four seconds for the semi-naked Rasta to engulf me in a giant, lung crushing bear-hug. Gorgeous environment and excessive hugging aside, Mandrea is a great place to see musical talent. Friday night headliner Max Romeo and his well-drilled seven piece band led the charge on the 'Amphitheatre' stage, with their tough yet tuneful set. Romeo has not lasted 40-something years without being an accomplished showman and the Jamaican prowled the stage, shaking his waist length dreadlocks whilst digging deep into the corners of his classic 1976 album, War Ina Babylon. Dressed all in red, the 70-year-old invites the crowd to sing 'Chase the Devil' – famously sampled on the Prodigy’s 'Out of Space' – before signing off with a crowd-bonding cover of Bob Marley’s 'Redemption Song'. Otherwise, genuinely ‘big names’ were thin on the ground. But for many, Mandrea’s commitment to showcasing new music is part of the appeal. Melancholy songstress Hayley Harland took to the tiny ‘Banjo Buddha’ stage and her beautiful acoustic harmonies seemed to fit the festival's mellow atmosphere perfectly. Later, sound issues intermittently affected Jack Cheshire’s set; his music – a hybrid of psychedelic melodies and Ian McCulloch-like vocals – is dreamlike in recording, but live and standing 20-meters back sounded sadly dreary. One band with no such problem was Don Kipper, who combined a kaleidoscope of musical styles, from Greek Rebetiko and Turkish Fasıl, to become one of the weekend’s highlights under the moon's bright glow. If you tire of watching bands, campers can explore the colourful installations that dot the site. A Moroccan tea tent proved a hit, where chatty folk gather to smoke shisha, and when you’re not skating or jewellery shopping, circus skills can be learnt, or simply take a Thai massage when it all gets too much. Mandrea may be a bit “out there” for some – say at the Zen Space workshop where a Rick Rubin look-alike pretends to be a guitar case – but for most, the group of 'beautiful freaks' (as they like to be known) made compelling viewing. Come 3am, the party zombies head for the uber-cool 'Secret Cinema' where art-house documentaries, independent films and small theatre pieces are screened until sunrise. It also made a great place to kip if, like me, your tent couldn't handle the downpour. On the camping front, 4-acres of picturesque meadow was set aside so peg-pushers could enjoy a generous slice of the Italian scenery. Under the shadow of jagged cliffs, the main camping field – split over three levels – is a spacious, friendly affair; making a refreshing change from the boisterous, cramped quarters you come to accept from most UK festivals. The only improvement might be the addition of hot water, as not every camper feels ‘refreshed’ with a cold shower and minimal privacy. But that’s a small moan for what otherwise was a basic but enjoyable camping experience. Surrounded by lakes of wind-ruffled water and perfect limestone, Mandrea is an outdoor playground. As Sunday brought the welcome respite of sunshine, windsurfers headed for the lakefront, paragliders to the lushly wooded slopes of Monte Baldo (2,100m) and climbers could be found clinging to Arco’s rock-face like brightly coloured lizards. 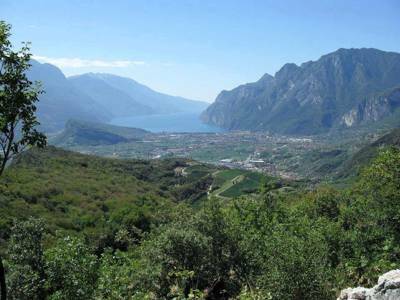 I took the festival shuttle bus to Riva del Garda: a handsome town on Lake Garda’s northern tip, for a 7km hike along La Strade del Ponale (the old lakeside road), which rises up to offer stunning panoramic lake views. “No wonder George Clooney loves it here!” declares the Dutch Rasta, speeding past on a bicycle. I suddenly feel extremely lucky; not for experiencing one of Europe's most picturesque festivals, but for avoiding yet another lung crushing bear-hug. By Andrew Day, August 2015.